DIRECTV CUSTOMERS TO GET AN ENHANCED COPA AMERICA EXPERIENCE, AT NO ADDITIONAL COST! In addition to watching all 26 Copa America games in HD, you and your customers can enjoy a dedicated Copa America Multi-View System that provides a 3 screen channel where soccer fans can have a real feeling for each of the Copa America games, at no additional cost! 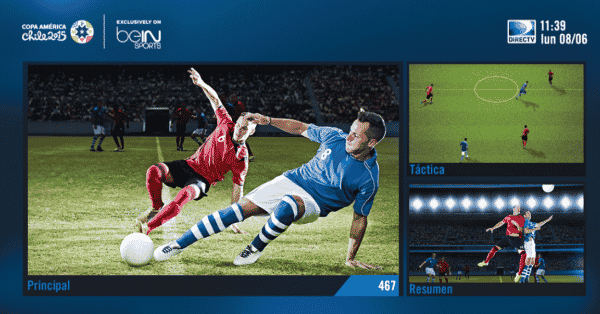 Available in HD only, the 3 screen system will feature the beIN SPORTS en español main game feed along with a game highlights feed and a tactical feed. By providing soccer fans with 3 unique viewing angles on one screen, you and your customers will see the action around the ball, get game highlights and much more… all in one screen! So be sure to check out this exciting coverage available only on DIRECTV, and at no additional cost! It’s just one more way that DIRECTV delivers the most soccer year-round and the best and most extensive Copa America experience! The Multi-Viewing System will be available from June 11th through July 4th on channel 467-1.